But run with the sympathetic undocumented immigrant narrative. It still won’t change the fact that this illegal alien committed fraud and church members were harboring a fugitive. From NY Post: A Mexican father who hid out in a North Carolina church for close to a year to avoid deportation was detained when he attended an appointment with immigration officials. Samuel Oliver-Bruno, 47, had a scheduled meeting Friday at a Raleigh-area immigration office to provide fingerprints and discuss a petition to delay his deportation, so that he could stay in the country with his wife and son, who is a US citizen, local outlets reported. About 20 minutes after he walked into the office, plainclothes US Immigration and Customs Enforcement officers arrested him. The CityWell United Methodist Church’s pastor, Cleve May, and more than two dozen other people who’d accompanied Oliver-Bruno to the appointment surrounded the car taking Oliver-Bruno away and were also arrested, CNN and the Effingham Daily News newspaper reported. 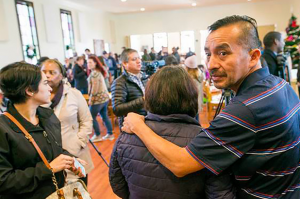 The pastor said church member feared the immigration appointment had been a trap set up by ICE to nab Oliver-Bruno — who came to Greenville NC., from Veracruz, Mexico more than 20 years ago. Congressmen David Price and G.K. Butterfield, both North Carolina Democrats, said they were “extremely alarmed” by the detention. “It appears ICE has acted in concert with officials at USCIS, who instructed Mr. Oliver-Bruno to appear at local USCIS offices to discuss his deferred deportation,” the lawmakers said in a statement. During his 11 months hiding out in living quarters built for him inside the church, Oliver-Bruno attended English classes, played guitar and read during services. “He helped construct his living quarters. He’s remarkable. He’s very generous and kind,” May told CNN. Oliver-Bruno will remain in US detention for the duration of his case. Apparently not all of Chiraq’s illegal guns come from Indiana. From MyFoxChicago: Most of the roughly 400 guns that were stolen from a United Parcel Service facility in Tennessee have been recovered in the Chicago area, federal authorities said Tuesday. Authorities seized about 365 Ruger .22-caliber and .380-caliber firearms after police officers responded to a call about suspicious activity in the southern Chicago suburb of Midlothian on Sunday afternoon – about 12 hours after the guns were taken from a UPS facility in Memphis, a Bureau of Alcohol, Tobacco, Firearms and Explosives agent said in court documents. If you have any information on Jackson’s whereabouts, call 1-800-ATF-GUNS. Some people have too much butthurt in their lives. From Daily Mail: A fifth-grade boy has been punished for calling his teacher ‘ma’am’ after she asked him not to use the term of respect. 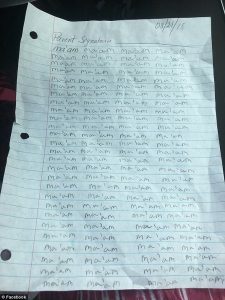 Student Tamarion Wilson, 10, was made to write out the word ‘ma’am’ repeatedly during class on Tuesday at North East Carolina Preparatory School in Tarboro, North Carolina. His mother Teretha Wilson was shocked when he returned home from the public charter school with the sheet of paper, for her to sign in order to complete the punishment. ‘I asked him what happened. He said he got in trouble for saying “yes ma’am”,’ the mother told ABC 11. The teacher had apparently warned the class not to call her ‘ma’am’, although the reason for the prohibition is not entirely clear. While the term of respect is sometimes reserved for married women, or those presumed old enough to have children, in many parts of the South it is used for women of all ages. Tamarion was hospitalized last month for a seizure illness that included hallucinations and memory loss, although the teacher was not aware of his condition, Wilson said. When the boy called the teacher ‘ma’am’ after she had prohibited it, the teacher said that if she had something to throw, she would have thrown it at the boy, according to Wilson. The teacher, who has several years of experience, admitted in a parent conference to saying she would like to throw something, but said it was a joke, Wilson said. Wilson and Tamarion’s father, McArthur Bryant, said that they had raised their children to address their elders as ‘sir’ and ‘ma’am’. ‘As a father, to feel kind of responsible for that…knowing that I have been raising him and doing the best that I can, it’s not acceptable,’ Bryant told the ABC affiliate. Wilson met with the teacher and the principal on Wednesday, and requested that Tamarion be placed in a different classroom. The principal granted the request, Wilson said. North East Carolina Preparatory School is a public charter school with grades kindergarten through 12. Enrollment was 960 at the beginning of the school year. It took me some time to find out that this driver was an illegal alien. Most of the stories had a headline of “man charged” and never provided the information from DHS. Way to hide the truth, SRM. From WRAL: A 27-year-old man was charged Sunday in connection with a wrong-way crash that killed two people Thursday night on Interstate 40 in Raleigh. Police said a Honda Civic with four people inside was driving eastbound in the westbound lanes of the highway at Wade Avenue. Rupresh Uprety and Pricil Chundapurakal were killed in the crash. The other two people in the Civic were being treated for injuries at WakeMed in Raleigh. Authorities on Sunday charged Anibal Raul Ambrocio-Chilel, 27, of Raleigh, with two counts of felony death by vehicle and one count each of driving while impaired and reckless driving to endanger. He was being held at the Wake County jail under a $410,000 bond and was scheduled to appear in court Monday. The Department of Homeland Security put an immigration detainer on him, saying that data on file and statements he made to authorities suggest he is either in the U.S. illegally or is subject to deportation. A Durham County 911 dispatcher called the 911 communications center in Raleigh at 11:35 p.m. Thursday to warn them the Civic was headed toward Raleigh. Three minutes later, an eastbound driver called Raleigh 911 to report the collision. North Carolina Transportation Secretary Jim Trogdon said Friday that wrong-way crashes are a national problem, but the I-40 crash represents at least eight such collisions in the Triangle since last fall. According to the state Department of Transportation, there were more than 500 wrong-way crashes statewide between 2000 and 2016, with 145 people killed and another 643 injured. According to the Center for Immigration Studies, Montgomery County, Maryland is a sanctuary county. From NY Post: A man murdered earlier this year by the MS-13 street gang was stabbed more than 100 times, decapitated and had his heart torn out of his chest and buried with him, Maryland authorities said Wednesday. Montgomery County Police said one of the alleged killers, 19-year-old Miguel Angel Lopez-Abrego, was arrested Nov. 11 in North Carolina. Lopez-Abrego, known as “Timido,” has been charged with first-degree murder and was ordered held without bond after his first court appearance. According to court documents, which cited interviews with a gang informant, up to ten MS-13 members planned to lure the victim to the Silver Spring park where he was killed sometime this past spring. The documents allege that Lopez-Abrego helped dig the grave where the victim was found, and also used a walkie-talkie to alert the other gang members to the victim’s arrival. The informant also claimed Lopez-Abrego was the first to attack the victim, stabbing him with a 15-inch knife. The informant led police to the grave on Sept. 5 and “detailed the choking, stabbing, decapitating and dismembering [of] the Victim’s body,” according to a police affidavit. The documents do not give a motive for the killing. The victim has yet to be conclusively identified. Police describe him as a Hispanic male standing approximately 5 feet, 2 inches high and weighing approximately 126 pounds. He had short, dark brown hair and a missing lower tooth that may have been noticeable when he was speaking or smiling. After the victim’s body was found in September, police released photos of the clothes and rosary he was wearing when he was killed. They included a sweatshirt with the words “First United Methodist Church Laurel, Maryland” written on the left chest. Anyone with information is asked to contact the Montgomery County Police Department’s Major Crimes Division at (240) 773-5070. From Fox News: A fire department in North Carolina stands to lose at least $19,000 because of its refusal to remove a Confederate flag from its property. The Uwharrie Volunteer Fire Department has been flying the Confederate flag in front of the fire station for years. Firefighters say it represents history and heritage, not racism. Montgomery County Commissioners (click on link to contact them), however, disagree. “The Board of Commissioners stated their position, that they did think the flag was inappropriate and requested for the fire department to take it down,” Montgomery County Manager Matthew Woodard (click on link to contact Mr. Woodard) told WFMY. The Board of Commissioners sent firefighters a letter last week saying that they will withhold funding for the department until it takes down the flag. The Charlotte Observer reports the Uwharrie Volunteer Fire Department gets $19,000 a year from Montgomery County, plus $400,000 annually for fire trucks. The department was organized as a non-profit corporation in 1983. Firefighters said they do not plan on removing the Confederate flag any time soon. “Uwharrie Volunteer Fire Department is a small rural fire department located in the middle of the Uwharrie National Forrest. We have served our community and surrounding communities since 1983. The departments volunteers have families, jobs, and are active in local churches. We have 3 fundraisers per year to obtain the necessary funds to provide first response operations to our community and surrounding fire districts. The restriction the county has placed on our funds makes the burden that the volunteers carry that much heavier. All donations received will go towards continued operations, firefighting equipment and turn out gear for the volunteers. The UVFD has always been heavily supported by its community and would like to say thank you for all of your support. The support the Fire Dept. has received during the recent days has been overwhelming and encouraging not only from our local residents but those from other states as well. If you’d like to donate, go here. From Fox News: A North Carolina high school recalled its yearbooks after officials saw a senior’s quote which read “Build that wall” ascribed to President Donald Trump — but the move drew criticism online. Yearbooks for Richmond Early College High School in Hamlet were recalled because some senior quotes were considered controversial, The News & Observer reported. The school district apologized and said it was working on making corrections with the yearbook publisher. “As a district, we do not and will not tolerate inappropriate conduct toward any of our students,” the post said. School and district officials found several quotes deemed inappropriate, school district spokeswoman Ashley-Michelle Thublin said. She said that included the “Build that Wall” comment that became one of Trump’s campaign slogans last year. She did not answer a question from Fox News about which other senior quotes aside from the “wall” one were considered inappropriate. An image of the senior quote was posted on Facebook Tuesday by user Artney Ellerbe, the Richmond County Daily Journal reported. Thublin said none of the students are being disciplined. It’s too late to get the books reprinted so students are being refunded. They cost $30 to $39 dollars based on time of purchase.